In this post, I want to share one of my experiences in Thailand. What's your first thought of Thailand? Tom Yum? Mango? Culture? Beach? Horror movie? Religion? or what? Yeah when we are talking about Thailand, there are many topics that we can share of. A unique country which has many stories. :) Related to architecture, as a religious country with Buddhism as the majority, there are many temples in Thailand. Wherever you go, you can find it easily. The temple is not only functional as a worship place but has a beautiful architecture and space too. Sacred and beautiful at the same time. And... Today, I want to share those 4 beautiful temples at Thailand that can make u mesmerize, like I do. Throw your coin and make a wish here. May the Gods hear and make your wish come true. Do you love it? Curious how's the inside? Mark it into your next destination at Thailand then! Your eyes deserved to see this amazing place. :) Ang Sila Chinese Temple is located between the AngSila Old Market and Khao Sam Muk monkey hill in Bang Saen. 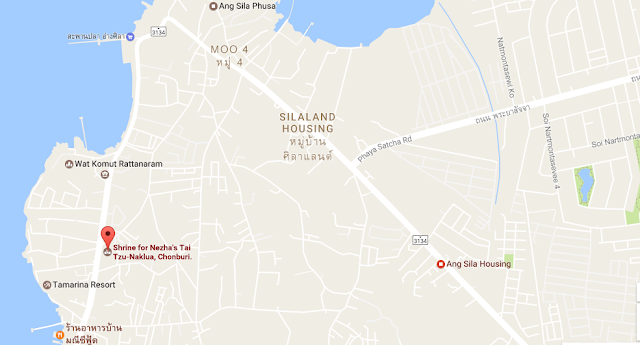 It's about 5km from downtown Chonburi City. Mon-Fri at 8 a. m. - 5 p. m.
Saturday at 8 a. m. - 6 p. m.
Sunday at 8 a. m. - 8 p. m.
Share your experience or in the comment's box below! And.. Don't forget to Subscribe Me if you love me ( My post i meant LOL) ! Follow my instagram for the daily updates !